English Youth Ballet (EYB) is one of the UK’s largest ballet companies and previously won The Stage Award for special achievement in regional theatre. The company brings together the finest professional principal dancers from London and around the world with 80 local ballet students selected for their talent and potential. English Youth Ballet (EYB) brings their moving production of Giselle to Worthing in a romantic full-length classical ballet production. The story follows the Army Officer - Albert and how he woos the weak-hearted Giselle and deceives her into believing he is a common footman. When she discovers the truth and that he is engaged to be married she tragically dies. In death, Giselle is transformed into a Wili spirit, in the forest. The Wili spirits are dance-loving brides who have died tragically before their wedding day. The Wilis seek revenge on any man who crosses their path. What will become of Albert when he enters the forest? The inventive choreography is faithful to the well-loved original version and was created by Janet Lewis MBE – EYB’s Artistic Director – and her team. The classic stage designs were created by Keith Bish. The evocative musical score was composed especially for the ballet, in 1841, by the great master Adolphe Adam. An extra section of music by Adam, that is rarely heard, has been added for the Hunt Scene. In this section the exquisite music can be likened to the sound of galloping horses. The professional principal dancers have joined EYB from some of the world’s most renowned ballet companies – including the Royal Ballet, English National Ballet, Northern Ballet Theatre, Royal Winnepeg Ballet, National Ballet of Portugal and Ballet de Toulouse. – Kim Chitty, BBC Nottingham. “The magic worked, EYB notched up another success” – Croydon Guardian. 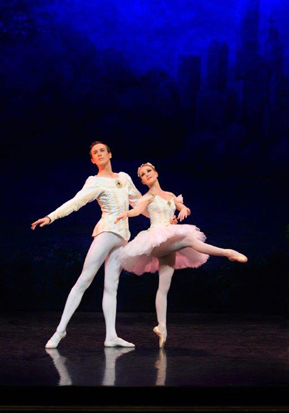 “English Youth Ballet is a triumph” – Dance Expression. English Youth Ballet was the winner of the Stage Award for Special Achievement in Regional Theatre in 2006 and Janet Lewis, director, was honoured with an MBE in the New Years Honours list in 2008. Production shots can be downloaded from the Gallery link. They are zip files and may take a little while to download.